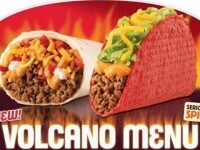 With the glorious return of the lava sauce from Taco Bell, we saw a new item come out, called the Volcano Quesarito. 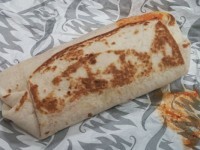 The Volcano Quesarito is identical to the previous iterations of the Quesarito, but this time, utilizing the lava sauce. I picked up a beef version for $2.69. By itself, the quesarito is very delicious menu item. 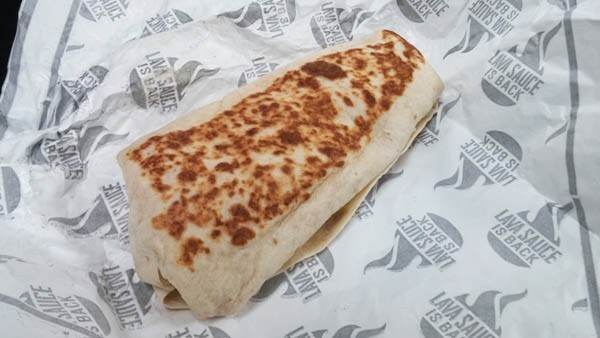 It features a grilled quesadilla with melted and nacho cheese, that has been wrapped into a burrito filled with season beef, rice, and sour cream. What is great about the Quesarito is the cheese mixture and the sheer volume of the contents inside. The Volcano Quesarito takes the regular Quesarito and adds in lava sauce to both the quesadilla and the burrito portions. The last time the lava sauce was available several years ago, I didn’t take advantage of it as I should have (I mainly stuck with tried and true items from the dollar menu). This is more of a new experience for me than probably many who have loved the Volcano menu over the years. Overall, I think the flavors were absolutely fantastic. In terms of spiciness, the lava sauce is about on the level of the Habanero sauce that we recently had in the DareDevil Loaded Grillers. The lava sauce is creamy with more of a spicy chipotle flavor. 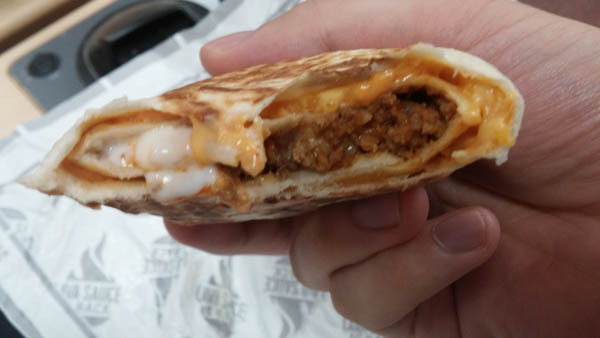 Inside of the Volcano Quesarito, it is more difficult to differentiate the actual flavor of the lava sauce when you have so many other things going on. The spiciness is delayed and eventually felt on the back of your throat, but not too overpowering. If you don’t like anything spicy, then this probably isn’t for you, but if you can handle it to the level of a couple jalapeños, then this is probably right up your ally. The spice is actually reduced with the combination of the nacho cheese and sour cream. I really don’t have too much to complain about with the Volcano Quesarito. There is a lot of sauce overall, that does make it maybe a little too juicy. Unlike the Sriracha Quesarito (which I did not like), the overall spice level and flavor of the lava sauce really complements the rest of the flavors, instead of overpowering them. I would have liked to see a crunchy element added to give the texture more variety. A fantastic item where the flavors really work well together. This was probably a perfect vehicle for the return of the lava sauce, and I hope that it is here to stay. If you care about calories, this one packs a punch with 700. 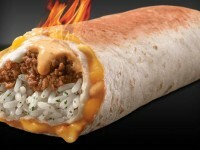 The Volcano Quesarito probably isn’t filling enough to justify the huge caloric intake (compared to other menu items). Also, anyone who likes the lava sauce can add it to almost any menu item for a small fee using the Taco Bell app.